We were introduced to The Pencil Grip, Inc. a little over a year ago and their products quickly became my family's favorite art supplies. 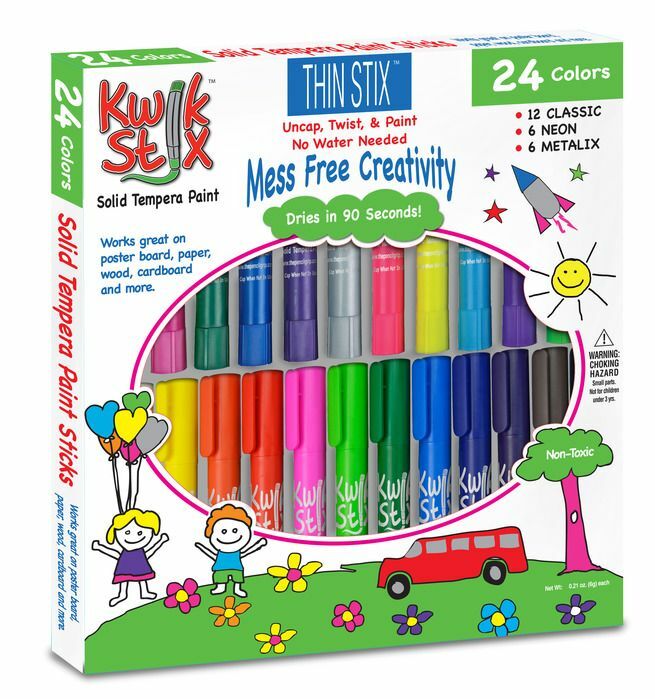 We absolutely love the Kwik Stix solid tempera paint sticks and our newest package is the Thin Stix Creativity Pack. The Thin Stix Creativity Pack comes with 24 tempera paint sticks. These are solid tempera paint sticks that dry in 90 seconds. They are thinner than the original Qwik Stix tempera sticks. The Creativity Pack includes 12 assorted colors, 6 neon colors, and 6 metalix colors. They are great to use on multiple surfaces including wood, canvas, cardboard, and even paper. They are mess free allowing children as young as 3 to paint with no mess and ease of use anywhere around the house or on the go for older children. This 24 pack is normally $24.99 but is available at BJ's online and in-store at a discounted price of $19.99 for a limited time. The Thin Stix are solid tempera paint and you do not need water to use them. You just remove the cap, twist the solid paint up and create your artwork. 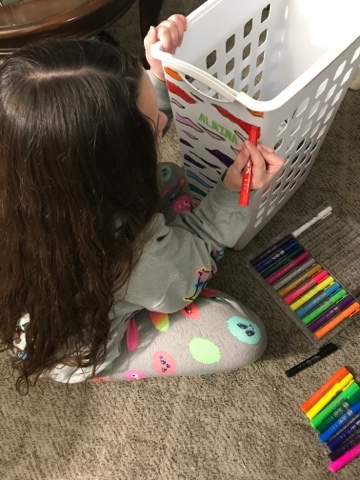 We have a countertop in our family room where we are supposed to do school and our craft projects, but we tend to all be in the same room no matter which one it is or what we are doing. By using Kwik Stix to paint with Alaina can be in the living room with the rest of use while she is painting without having to worry about water getting spilled or paint getting on the carpet. There is absolutely no mess involved. Alaina is my crafty child. She loves anything that has to do with art or crafts. 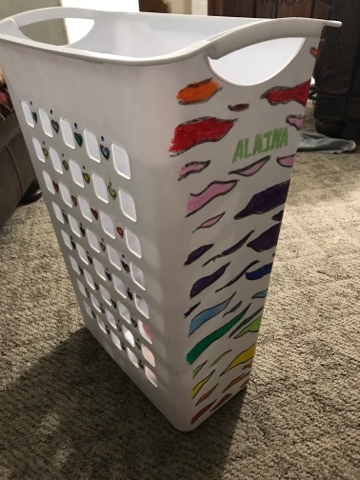 She wanted to come up with something creative to do with her tempera paint stixs so she decided she would decorate her laundry hamper. At first, she was concerned that it would smear right off, but they dry so fast she didn't have any problem painting it. The paint went on very smooth and turned out great. Once it dried it didn't wipe off but because it was a slick surface we decided to spray it with our art fixative just in case. Alaina decided she wanted to do zebra stripes on the ends. She used all the normal colors except brown and white. 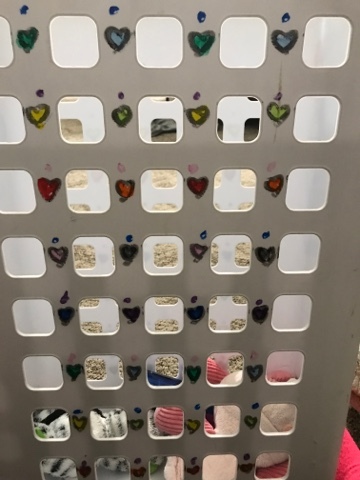 On the side, with the holes, she chose to paint little hearts in between each one. The original Kwik Stix would have been too fat to make the tiny hearts, but the Thin Stix worked just fine. She uses her tempera paint stixs to make cards or just to paint pictures. She will even take these in the car if we go on a road trip. Who would have ever thought you could paint in the car with no mess. The Pencil Grip, Inc. offers a variety of school and office supplies including pencil sharpeners, stickers, paper clips, and of course pencil grips. The Pencil Grip, Inc. has offered me another Thin Stix Creativity Pack to giveaway. Just enter the Rafflecoter below. These would be fantastic for my daughter for her science fair project coming up. I notice I write my name a lot & doodle flowers!